Beáta Dósa was born in Mezokövesd in north-east Hungary and spent her childhood in the village of Tibolddaróc on the edge of the Bükk National Park. Beáta’s first experience of hill walking was in the Bükk and Zemplén with the state socialist youth movement or Pioneers. She attended Sárospatak bilingual school and went on to take a Masters degree in History of Theatre at the University of Veszprém. As a freelance translator and interpreter Beáta has worked for Hungarian television and non-government organisations. 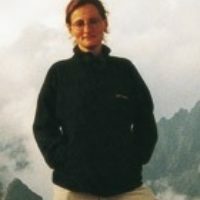 She enjoys walking but particulary enjoys the Scottish Highlands, English Lake District and the Slovakian High Tatra.